"My dream was to touch Dennis Brown"
Many of the great stars of foundation Jamaican music began their careers as children. In the 1960s the likes of Delroy Wilson, Errol Dunkley, Freddie McGregor and Dennis Brown walked into recording booths or onto talent show stages, needing help to reach the microphone. By the late 70s and early 1980s gifted kids were still sneaking out of their bedrooms to take the mic at sound systems and studios. Once such talented youngster was Triston Palma. At just eight years old he was voicing songs in his dried honey timbre for decorated Kingston producers. When his age reached double figures he had scored number one sides concerning subject matter that ought to have been beyond his experience. His herbal hits Spliff Tail (for producer Ossie Thomas) and Joker Smoker (for Jah Thomas) took him from obscurity to international fame, and the realisation of his childhood dream: sharing the stage with his idol Dennis Brown. By the time he was out of his teens Triston was an established name and turned his hand to producing artists himself. 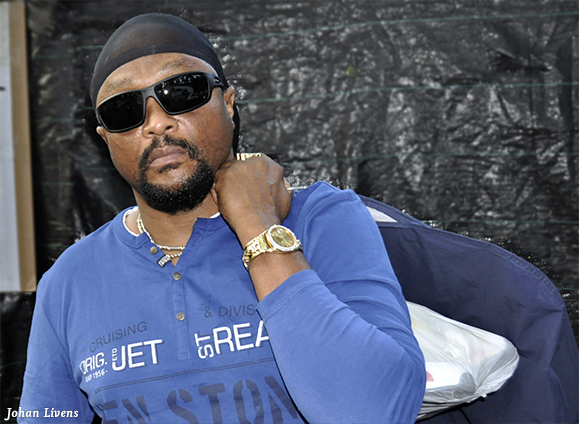 Just as he had been mentored by elders including the two Thomases, Sugar Minott, Tony Tuff, Soul Syndicate’s Tony Chin, and Captain Sinbad, he proved instrumental in launching one of the next generation’s child stars, Beenie Man. United Reggae spoke to Triston on Skype from Belgium in 2015 when he was touring and working on album Live In Europe (released in late 2017). The diminutive Palma, whose still youthful singing voice has the same pitch as his speaking voice, shared his fascinating story of preternatural talent in a musical hotbed. So much happened to him in such a short time that most of the 2 part interview was spent unpicking exactly which successes occurred in which order. Palma, who says he suffered from shyness as a young boy, was hesitant at first in answering questions until he realised United Reggae knew the background to the writing of Spliff Tail. His demeanour changed radically and he began talking at length, laughing and joking throughout as if among old friends. You grew up in the Waltham Park area of Kingston – how did you first start singing? I used to live at 23 Delamere Avenue, Waltham Park Road, Kingston 13. I used to have a brethren called Ossie Thomas, he is in England, who had a label by the name of Black Solidarity. But before Black Solidarity there was a producer by the name of Bunny Striker Lee. My aunt who lives in England, Hilda Rowe, she used to sing for Striker Lee and she sang some songs in England. Her son’s name is IQ Michael. I’ve just done some recording with him in Jamaica. So Striker Lee would come to my house to check my aunt and my aunt said “My nephew can sing good.” I sang to Bunny Lee and Bunny Lee said “Wha?” and invited me to the studio the next day first time. We did two songs named Love Is A Message and Dream Of Me for Striker Lee. I was about eight years old. What singing had you done before that? Before I started to record, me and my mother used to sing in the church. My mother and father were Roman Catholics. I used to stay with her in the church and do a little back up for her because my mother was a good singer. Because it’s her I really hailed from. My grandfather used to play the violin. I think it basically comes from my mother. My mother really loved singing. She liked to be in the church singing. What did your mother and father used to do for a living? Well my mother used to take care of us you know? My father used to raise cow and goats and all those things. He was a man who loved the farming. Where was his farm if you lived in Kingston? Let me tell you now. Because we had a big backyard my father was a man who used to raise his cows around there. Cows and goats because he had a very huge backyard. And he was also an A1 carpenter. He would build houses and work in hotels doing carpenter work. That was really his profession being a carpenter but he loved his little cows and all those things. As well as knowing Bunny Lee you also knew Tony Chin from Soul Syndicate. How I knew Tony Chin was he lived on the corner in front of my house on Delamere Avenue. One day I went to rehearsal because Tony Chin was playing in a band called the Soul Syndicate band. When I went up there I saw men like Dennis Brown, Big Youth and quite a few more elders. But the person who really had me was Dennis Brown. I said to myself “One day you will reach somewhere like that man there you know?” So my dream was to just touch Dennis Brown and know Dennis Brown at the time as a little youth. One day I was singing out of my gate with my friends and there was a percussionist in the Soul Syndicate band. I can’t really remember his name. He heard me and he was standing there listening to me. I went up the road before they had their rehearsal because I would always stay out of the gate on the corner and listen to them. The brethren saw me and said “Tony, this youth he can sing you know?” When he said that I was kind of surprised like “What is he saying?” Tony said “Where do you live?” I said “You live in front of my yard man I’m Miss Palma’s son”. He said “Alright after the rehearsal I’m going to come down the road and we are going to jam”. So after the rehearsal we went over to his yard and played his guitar and I sang (sings) “Stop can I have a little talk with you? I want you to understand I want to be your lover man”. So we were rehearsing on the guitar and getting some flex and thing and then after that I went and recorded that song. About three songs I recorded with Tony Chin with Fully and them helping to play the rhythm. I went to record those songs on the Black Solidarity label. Me and Ossie Thomas, we were two youths who started up a label Black Solidarity. So you recorded the song A Class Girl with Tony Chin before you recorded Spliff Tail with Ossie? A Class Girl, then Spliff Tail, then Stop Can I Have A Little Talk With You. It’s Tony Chin. But here is a joke now Tony Chin and the group named Big Mountain sang over about three of those songs on their album and they didn’t give me any credit. I heard the album was in the Billboard. And those songs were written by me. Because if you listen to the lyrics I even have the original 45 and if you listen to the lyrics you can know that it’s a little boy that’s happy to see a girl (sings) “Stop can I have a little talk with you” “All my girls got to be A class girls”. So they sang over those songs they didn’t give me any credit but it’s all good. So which tunes apart from Mr DC did you sing on at Studio One? DC and quite a few. It’s a long time you know but quite a few. And then I started to do most of Sugar’s harmonies on the Black Roots label and then some other little man might come in the studio and do the harmonies for him as well. At the time it was mostly me and Tony Tuff doing the harmonies for Sugar. When Tony Tuff was singing it was me and Sugar doing the harmony as well. Sometimes it was me alone. So as a little boy you were inside Coxsone’s studio? I went into Coxsone Dodd’s studio but not as the lead singer. Trust me, I had a little nervousness but I wanted the experience. I was a little nervous because of different studios when you hear of Coxsone you say “Wow”. Just like the first time I went into Joe Gibbs it was amazing but I still had a little nervousness. But to tell the truth I liked the vibes they gave me because it wasn’t any negative vibes or anything. I wasn’t a major person that they were really focusing on because I was just doing back up. I was just harmony. I just enjoyed myself doing knowing that I was singing harmony with Sugar Minott or Tony Tuff you know? At that time I was glad for that experience. Because I knew one day Triston will be Triston as well. So Sugar Minott started his Youth Man Promotion sound. Were you the original youth man he promoted? Of course! Me and Little John. Youth Man Promotion was started by Triston Palma, Little John, Captain Sinbad, and Steely from Steely and Clevie. That’s where Youth Man Promotion started. Then everybody started to come in and come in but that is where it started. So Ossie Thomas came to you and wrote Spliff Tail with you - Captain Sinbad suggested the opening line? Well actually you know there was a guy by the name of Johnny Lee that helped us. One night I was sitting, I cannot forget that, sitting underneath the light post with Ossie. He came and said “Yo Ossie, Triston I have a riddim for you” but everybody had that guy as a madman! Because he wouldn’t talk after five. He wouldn’t talk at night. So he said he had a rhythm with Sugar Minott and they put Barry Brown on it and a lot of things he was talking. So we were sitting down listening to him and he said “Triston hear me now anyone who goes on this riddim now you’re going to mash up the whole of Jamaica!” We said “Which riddim?” So he said “This DAT that I will give you Triston the riddim is upon it seen? The riddim that Barry Brown is upon”. So I said “How the riddim go?” So he said “Hold this DAT and go sing the song”. So the next day we went into a studio in New Kingston and while we’re walking we see Captain Sinbad. Sinbad said “Yo Tris” and we said “Me and Ossie are going to a studio to listen to a riddim and listen to see if we can put something upon it”. So we all started to walk and we reached the studio and Ossie gave the man the DAT and we heard the rhythm. We said “What? It bad man”. Sinbad said to me “Triston you have any lyrics you can put on it?” I said “I have nothing yet“ so he said “Alright me have two line me can give you, but you have to finish it”. So I said “Okay let me hear it” and Sinbad said “Babylon fi try fi lock me in a jail for one spliff tail, no officer”. So I started to write now “Sitting upon I man corner on Delamere Avenue smoking the good Sinsemilla.” Ossie put in a few little words because that’s how we worked it. So I told the engineer “Please I beg you, let’s take a trial run”. Which studio was this? Was it Pluto Shervington’s studio? So Scorpio now introduced and said “This little boy from down the road here you know” and Ossie said “Delamere Avenue. Go listen to it because this little youth is going to mash up the place!” And the man put it on and they heard (sings) “Do officer”. Now Triston Palma everybody around my little area knows Triston Palma because the fence then started to kick down now. Fence start beating down and everything and a place smashed up. Here comes the police to stop the dance! They stopped the dance because of the lyrics or because people were beating down the fence? They just came to stop the dance! Because pure noise they made and beat down the fence so they just stopped it. This was Commissioner Joe Williams that stopped the dance? The same Joe Williams that used to make the people wearing Clarks stand to one side of the barefoot people stand on the other side. Joe Williams! (Big laugh) How old are you? Cho! You’re knowing everything man! Yeah man! He said “Little boy form a line over there so” but when he said that a man put through a back fence and ran and ran down the whole of Delamere Avenue because he can’t afford for him to be put away! But he never knew the joy that we got. (Laughs) The dance got shut off at about 11.30 or 12. I couldn’t go home - my mother can’t know! (Laughs) I had to take a back fence to go in! So that was a great experience. But then the radio banned the tune temporarily – saying it was not fit for airplay. So who was on the panel? You said you went to a Soul Syndicate rehearsal and you watched Dennis Brown through the fence. Did it feel good to be a child singing star like how Dennis Brown started? Yes! My dream! When I saw that man I wanted to sing! And when I met Tony Tuff and Sugar Minott it made it worse! I said “No man, this is what I want. This is what I need”. So school got cut - just Tony Tuff and Sugar Minott. I wasn’t even penetrating school that much again. But even the teachers did find out and said “No man, this one here is a bright, bright youth and something is going on”. But I just couldn’t stay away from it. One tune I haven’t heard you talk about in interviews which is one of my favourites is called Bad Boys. When did you record that tune? The Bad Boys tune was voiced after the A Class Girl and Spliff Tail and all those songs. Because at that time in Jamaica it was politics. Politics was strong. So I came up with that song Bad Boys (sings) “Bad boys Babylon no like you”. That was produced by Black Solidarity as well. But it came out on the label She Get Up And Skank? That’s our label as well. She Get Up and Skank label was owned by me and Ossie as well. So tell me about Bad Boys - you mentioned there was some badness going on - this was after the 1980 election? I think it was in the 80s. Yeah, yeah after that pure things were going on. I think it was some shooting going on on Waltham Park Road. Some shooting. I don’t know if it was that a campaign meeting or something like that. Something like that gave me the vibes to write that song. Did you see it or did you just hear about it? No man, I was there. I was there on the corner looking down the road. Because I didn’t get the chance. I got the chance to thief out from the corner but I didn’t get the chance to go down there, I don’t know if my mother was coming to walk up from the church or something. That’s Ricky Trooper’s favourite song! So did you and Ossie Thomas write the song? You see in most of those times me and Ossie we had a thing. Me and him, even if it was me who wrote it, he was a man who would come and put in two or three lines. Because that’s how we really did it in those times there you know? I think that song was recorded in King Tubbys. Do you remember which musicians played on the rhythm? I think it’s Soul Syndicate that played that rhythm. Scientist was the engineer. In those times Scientist was a youth so we would work with somebody in our range. After that you had some more number one hits. I’m Ready on the Taxi rhythm. Black Solidarity again. Trash and Ready. What A Bubbling. Mona Lisa. So now tell me about Jah Thomas and how he came to your house early one morning. Then one day there was a producer by the name of Jah Thomas. He went to New York and saw a brother by the name of Tads as in Tads Records. So Tads said to him “Jah Thomas, you know a singer by the name of Triston Palma? The man has a tune going good in England at the moment all the ladies singing over back song by the name of A Class Girl“. (Sings) “All my girls got to be A class girls”. Well here it now. John Thomas went and found Tad’s and Tad’s told him about me so he came to Jamaica. Because he heard A Class Girl. And you didn’t even know A Class Girl was released? Oh no. I never knew anything was going on for me in England. I didn’t know anything at all. Don’t know who released that tune in England trust me. I know that after, Ossie put it out on some Triston Palma album. I recorded it with Tony Chin after the rehearsal. Tony Chin is my brother - a very good guitarist. Even though he recorded those songs in California but so it goes. Tell me about Jah Thomas. Thomas came to my house and said he had a song he wanted me to sing. He wanted to do some work with me but I was hesitating until my baby mother said “Cho! 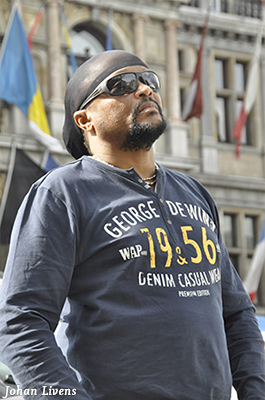 Gwaan man”. I got a youth young you know! (laughs) So I said “Alright” and made him walk down to King Tubbys again. This was your hit Entertainment. We walked down to King Tubbys and he said he had a song for me to sing. So he started to sing the song and I have to give him the credit. It was an incident that he saw in the dance. And he actually sang it and he actually wrote it and told me. Which musicians played on that, which studio and which engineer? I think it was Roots Radics who licked those rhythms. I think those rhythms licked at Channel One and I can’t remember the engineer. Was it Bunny Tom Tom, Barnabas or Souljie? Not Barnabas. It was either Bunny Tom Tom or Souljie Hamilton. Because most of Thomas’s rhythms I was not there when he did them. I went and voiced at Tubbys. So Jah Thomas was inspired to get the idea for the song by someone who mashed up the dance. Which dance was it? I don’t know. He went to the dance! He told me about it and I put one and two lyrics and I voiced it that day and mixed and carried it to Skateland in the night. The same time he did it he just cut it upon dub and carried it to Skateland for the night to a sound named Kilimanjaro. It was the first two or three sound clash and that song won the dance for the night. Jesus God! Then after that it started to mash up the place and he came and said “Triston can’t fly upon one wing. We need another song. We need one more song we going to mash up the place more”. But in those times I have to tell you I just wanted to sing. I just wanted to hear Triston have a number one, never mind credit. So we got the studio again and he started telling me again saying “Man a beg a Rizla and a lighter because them a joker smoker”. So he gave me the lyrics and when it reached the bridge part he said “Give a way I don’t feel no way” so I just reached that point and I just wrote it. Another number one I had – God! Now you’ve said that Joe Thomas helped you write Joker Smoker, Captain Sinbad suggested the first line of Spliff Tail. You didn’t smoke herb was a little boy? One time or two time! (Laughs) I can’t have my mother knowing those things are you crazy man? Can’t do that my mother was strict in those times she was anything I did she had to know I would do. If I would come out and go to the dance I would have to squeech out and go over a fence where Sugar Minott and Tony Tuff would wait for me and we would go.